We’re extremely proud to say that we have been working with tournaments and leagues for almost 15 years now. We provide websites, registration, scheduling, communication, mobile apps, scoring, standings, reports, online check-in and so on and so on. While this does make some things easier for the hundreds of thousands of teams, our primary focus was always on the events and how to make it easier for them to run like a well oiled machine. SincMyTeam is meant to get your team (your whole team: Coaches, Managers, Parents, athletes and family) in sync. The primary focus of the system is on organization and communication. When everyone on the team is in the loop, knows when practice is, knows when its been rained out, knows when the upcoming tournaments are, knows where they upcoming fields are located, know what their assignments are, …..in fact, knows ALL of your important information; everyone can focus on playing (or watching) the sport they love! 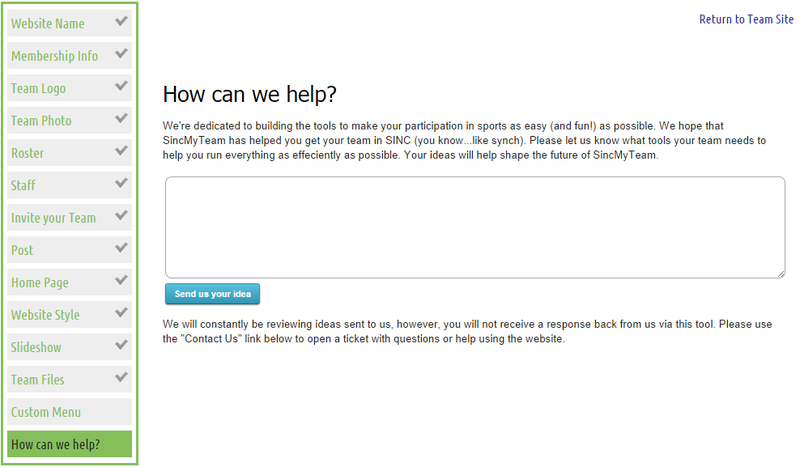 Please take a look at all the features you receive with SincMyTeam [click here]. We have a free option so everyone can take advantage of the website and a subset of the features. We’re also giving out a 30 day trial of ALL features (no credit card required) so you can try out all that we have to offer. We’re very excited to provide this to over a quarter million teams who are already attending SincSports events and using our system. As you go through the setup of your website and use the features, please let us know if there is anything that we’re missing that would help you run your team more efficiently! We’re dedicated to building the best tools you need for the sports you love.